The Design Team for the Annual Dr. Martin Luther King Celebration reported to the venue bright and early (8:00 am) on Saturday, January 13, 2018 to carry out final preparations for the day’s event. The Celebration was scheduled to start at 10:00 sharp. Anxiety among the team built as 9:45 came and went, and only a few dozen attendees were in the large banquet room at the Global Learning Center on the campus of Greensboro’s Bennett College. The event began as close to “on time” as it ever has with greetings from the customary dignitaries: Dr. Phyllis Worthy-Dawkins, President of Bennett College, Bishop Paul Leeland, Episcopal Leader of the Western North Carolina Conference of The United Methodist Church, Dr. Nancy Rankin, Host District Superintendent of the Northern Piedmont District, and The Honorable Yvonne Johnson, Greensboro Mayor Pro Tem and Bennett College Alumna. Thus, the day was set for the plethora of engaging activities including: spirited and harmonious singing from the Bennett College Ensemble under the direction of Ms. Dorthea L. Taylor; thought provoking videos; vigorous table discussions about modern immigration principles and policies, led by students from the Hispanic House of Studies from Duke Divinity School and the Duke Neighborhood Seminary in the Northern Piedmont District; recognition of and awards presented to the Bennett Belles involved in the Greensboro Civil Rights and Sit-In Movements. Dr. Linda B. Brown, Bennett College Alumna and author of the book, Belles of Liberty, also gave remarks regarding her essential writing and her experience with the civil rights movement. The morning culminated with the unveiling of a painting by noted North Carolina artist, Mr. Fredrick Jones. The inspired artwork was then presented to Bishop Paul Leeland. The pinnacle of the event was ushered in by a march from the Global Learning Center across campus to the Anne Pfeiffer Merner Chapel with the crowd being led in singing by the Belles of Harmony Gospel Choir. It was capped with the keynote address by Rev. Dr. William “Bobby” McClain, Professor Emeritus, Wesley Theological Seminary and Interim Pastor of Union UMC, Boston MA. 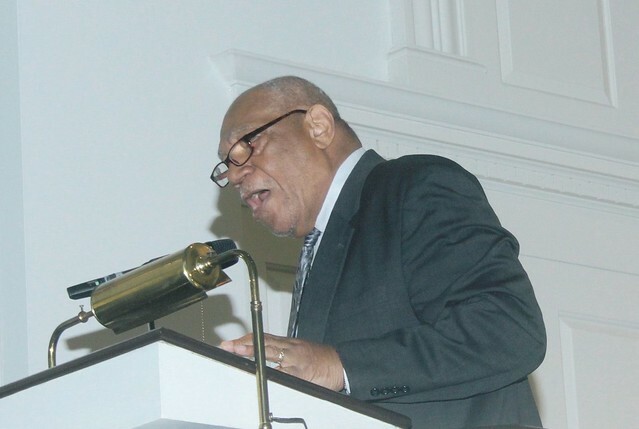 Dr. McClain’s remarks mirrored his own history as a teen-aged preacher in his hometown of Gadsden, AL when he met Rev. Dr. Martin Luther King, Jr., who was pastoring in nearby Montgomery. Dr. McClain’s preaching was rich with history, humor, and holy moments of clarity. His words fused the divide between “time” and “eternity.” Both belong to God and are given to humans to be stewards of these precious gifts. On this day, Dr. McClain, practically and vividly, taught us how the 2018 Annual Martin Luther King, Jr. Celebration folds into the fabric of God’s Time to benefit all who maintain the hope of redeeming their time for God’s great glory. With every gathering of God’s people at worship, there is an expectation that an offering will be received. The offering for this event benefited the Bennett College Scholarship Fund and was given in memory of Mrs. Doris Ferree, a faithful Bennett Alumna and a true Bennett Belle in every way. The culmination of a great worship experience could only be heightened by the sharing of Holy Communion. While our keynote speaker was being whisked away to catch his flight, Bishop Paul Leeland was the celebrant for the holy meal. Prior to the sending forth, Rev. Stephanie Hand invited attendees from each district to apply for seed money grants offered through the Justice and Reconciliation Team. The money will be used to continue specific conversations and activities designed to promote new initiatives in the areas of racial reconciliation and restorative justice. There is one final note that must not be overlooked. Many of the persons photographed can be seen wearing a white ribbon. The ribbons were worn in solidarity with those who have experienced inequality, sexual harassment and sexual misconduct. Members of the Western North Carolina Conference Justice and Reconciliation Team and the Dr. Martin Luther King, Jr. Celebration Design Team dressed in black and wore ribbons to stand in solidarity with those who have experienced sexual harassment and sexual misconduct. Thus, the end of another perfect Dr. Martin Luther King, Jr. Celebration…a little past our scheduled time, but, not to worry…it’s God’s Time! Rev. Miller C. Carter, Jr.